CO2 Hemp Extracts – 50:50 blend of Raw and Heated cannabinoids (i.e. CBG-A:CBG) and Steam Distilled Hemp Extract high in terpenes. This Hemp Extract blend is a special formulation of various different hemp extracts high in terpenes. 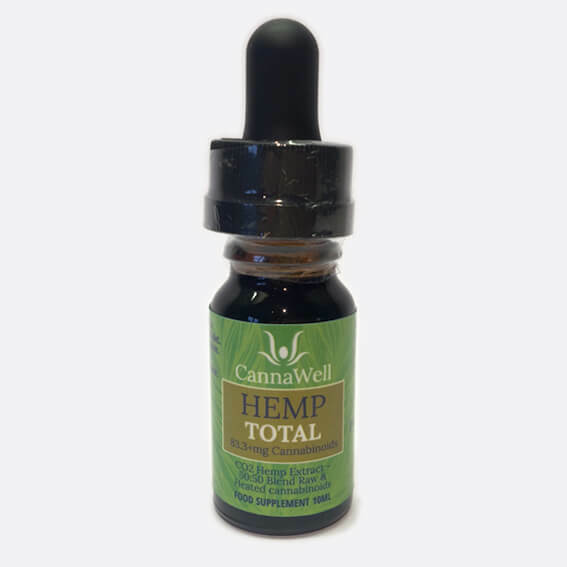 As opposed to Callawell’s Hemp PURE, Hemp TOTAL contains both the decarboxylated (i.e. CBG) and non-decarboxylated/raw (i.e. CBG-A) forms of cannabinoids, in a 1:1 ratio. In addition, they have also included a steam (water) distilled hemp extract which contains a significant amount of additional therapeutic constituents known as terpenes. Our steam (water) distilled hemp oil contains at least 26 different aromatic terpenes plus various aldehydes and ketones. Take 15 drops per day, more or less, as desired. 15 drops contain 4.2+mg cannabinoidsThe amount that people take on a daily basis can vary greatly. Take it morning or night, on an empty or full stomach. Should be stored in a cool, dry place away from direct sunlight. Can be refrigerated. Consume within 6 months once opened. Shelf life is approximately 1.5 years (2+ if refrigerated). We encourage doing your own research & experimentation with hemp extracts in order to find what feels best for you!